Winning a Webby Award is an honor that should be displayed with pride all year round. To keep with our mission of celebrating the best of the Internet, we’ve compiled this collection of how our Winners are celebrating their awards and sharing their recognition. The Great Agency created a call-out box on its homepage to promote its winning work. Medication info startup Iodine and movie-rating site Rotten Apples know that a Webby win signifies Internet excellence and should be the first thing visitors see on their websites. Placing a Webby logo and details of your recognition on your homepage shows your revolutionary work has been recognized on the world stage. Cosmic-Watch listed their win on their app listings. Social media management app Buffer touted its Webby honor in marketing materials. • Like astronomic time device Cosmic-Watch, highlighting your Webby win in your app store listing instantly marks your product as credible–and a cut above the rest. In an oversaturated market, consumers want products with stamps of approval. Identifying a Webby win exponentially sets your product apart. For production companies Novo Films and Unity Technologies, and fashion video network Made 2 Measure, adding the Webby seal to their project pages helped showcase the impact of their art. Potential clients and partners will see that you produce award-winning digital work. Consider future business deals closed. Eighty percent of Webby Winners attribute their win to earning new business. Once you’ve won a Webby, it’s time to spread the news. Winners MindBodyGreen and WIREWAX shared their achievements with supporters through blog posts and press releases on their websites. WeTransfer worked closely with the Webby team to release the news and incorporated a quote by Webby Executive Director, Claire Graves, celebrating their standout work. Crafting original content lets you tell the story of your Webby-winning work, while boosting engagement, site traffic, and overall support. As more people read about your win on media outlets, it trickles down into elevating your business. The chance to list a Webby Award is a special honor, reserved only for the Best of the Internet. Honor your great work through images, vibrant copy— or if your number of wins exceeds the word count, like Retro Report and PBS, create an Awards page listing each Webby Win, and increase your win’s visibility in Google Search. Receiving a Webby Award is an important accomplishment. Consumers, sponsors, and advertising partners agree. Don’t shortchange your success—let those wins shine. 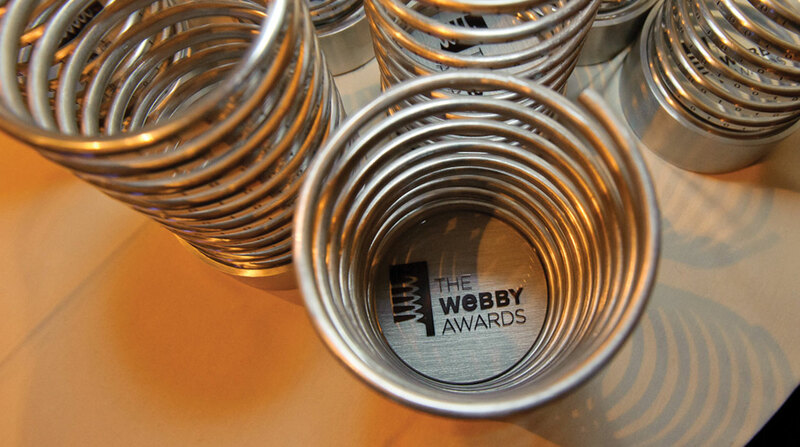 Social media is a great way to keep the conversation going about your Webby Award. Sharing your success with consumers, influencers, and partners on social expands your brand’s reach to a global audience. If your work features a celebrity or influencer, have them shout out your Webby win on their platform. That’s what Winner NPR did for their project featuring Robert Glasper. Make sure your Webby Award is prominently seen in photos you share in your media kit, on social, and everywhere else, as Winners David Chang and NASA did to remind fans why they are the best of the Internet. You can watch all the highlights from the 22nd Annual Webby Awards, to see how your fellow Winners celebrated the moment! We want you to get the most out of your honor. Send us examples of how your fellow Winners are telling their story, sharing their recognition, and celebrating their awards. Download the full Winners Showcase below.